The goal of this project was to come up with an earring that doesn't take too much attention away from the earwire. 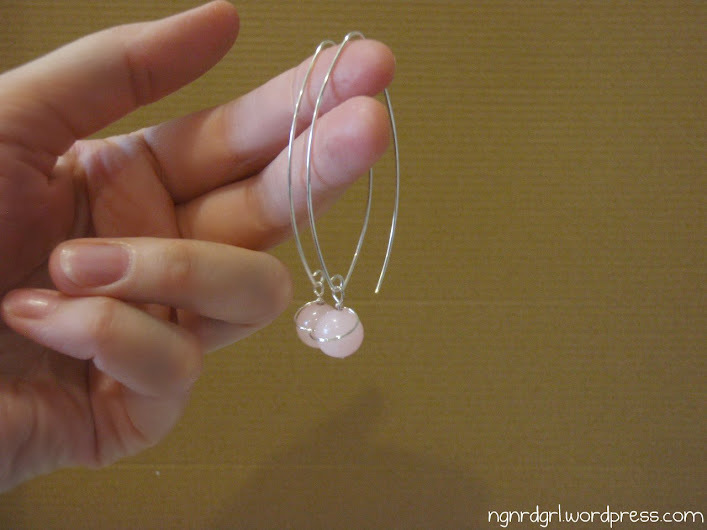 I wanted a really simple earring to contrast with the more elaborate earwire I made in my Easy Peasy Earwires Part 2 tutorial. At the same time, I didn't want to just use a headpin and basic loop, as I thought that would be too plain for this fancy earwire. I wrapped wire around the bead to create an interesting connection to the earwire. It reminds me of the rings around Saturn. When I wore them for the first time, everyone wanted a closer look to really take in how they are constructed. 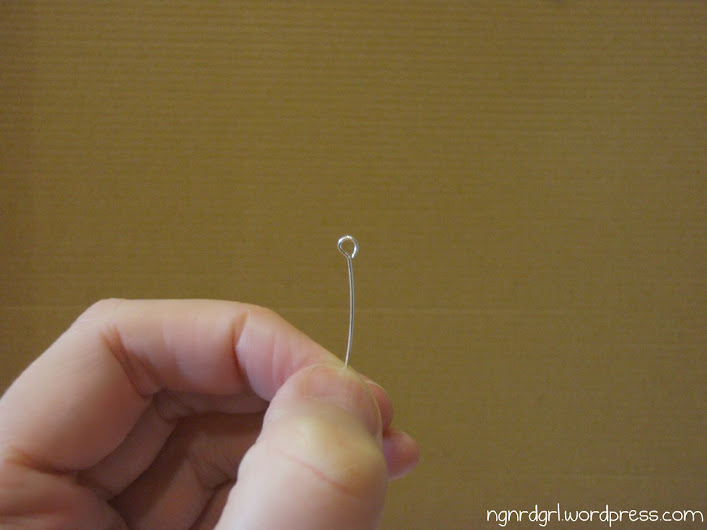 Wire 1: the Basic Loop - this tutorial steps you through tools, supplies and the basic loop. 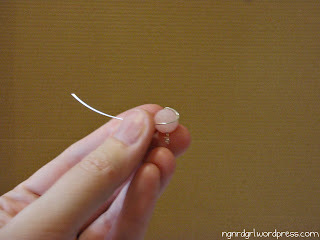 1 pair of earwires - I used a long V shaped earwire that I made in my Easy Peasy Earwires Part 2 tutorial. If you are purchasing a earwire, look for a statement earwire. Something long and graceful to add to this simple earring. 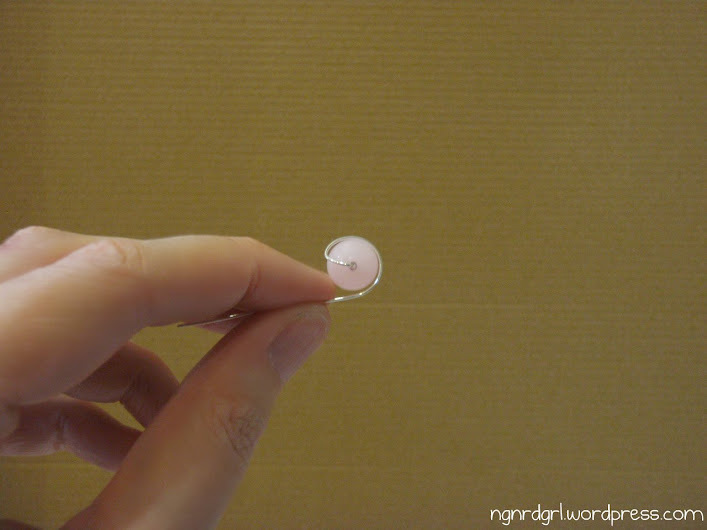 1 pair of round beads - you will want a medium sized bead so that there is plenty of room to bend the wire around the bead. 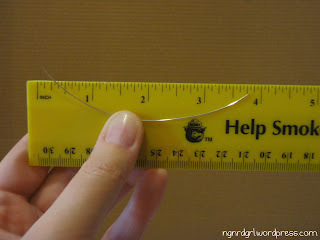 First, cut two wires roughly 4" long. Make an eye pin the way we did in the Wire 1 tutorial. 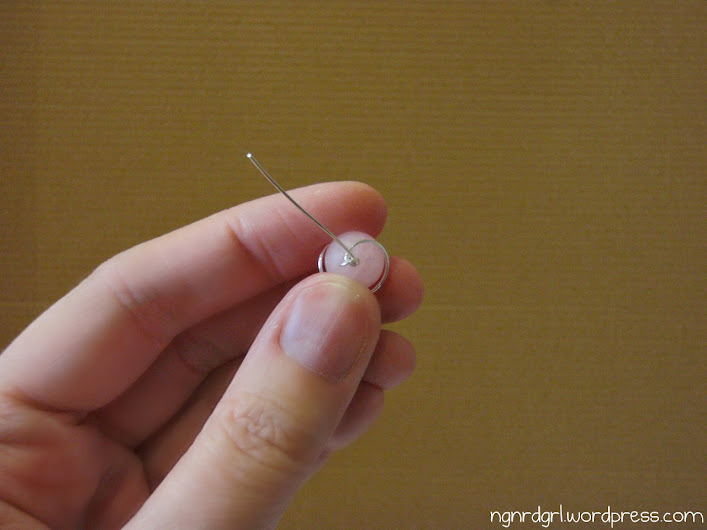 Thread your bead onto the eyepin. Leave some space between the eye and bead and fold the tail end over the top of the bead. Keep wrapping the wire around the circumference until you get back to where you started from. 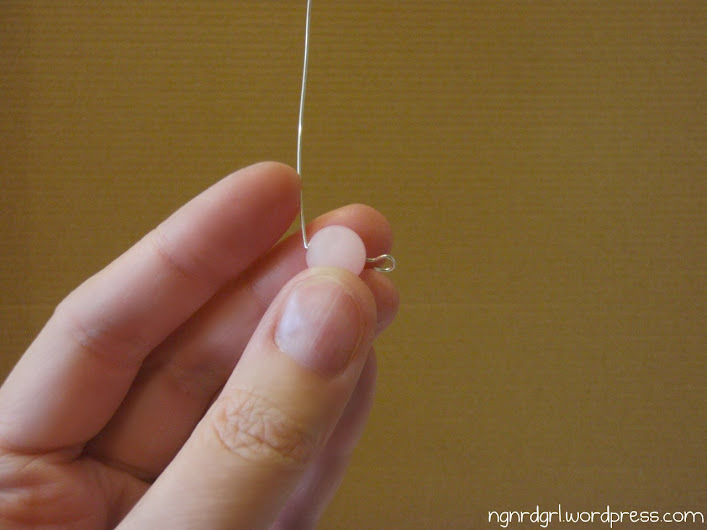 You will stop wrapping the bead once you get to roughly the beginning of the wrap. 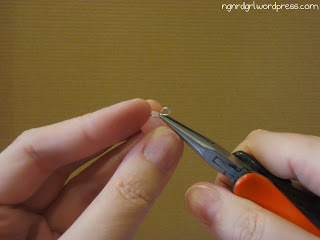 Finish wrapping the bead by bringing the wire up to the eye. Wrap the wire around the base of the eye. I wrapped the wire only once around the stem. Cut the excess wire off with your flush cutters. 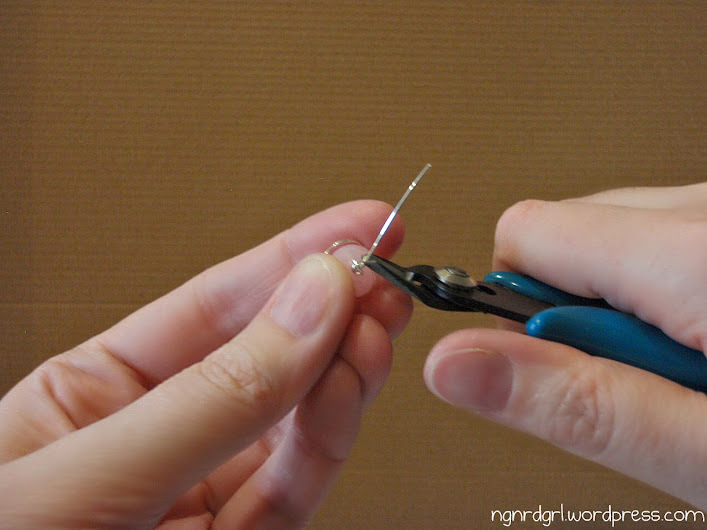 Use your chain nose pliers to tuck the cut wire closer to the stem of the eye pin. 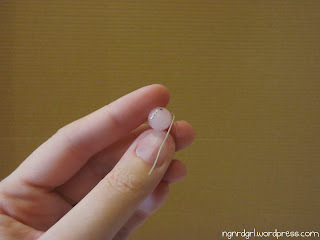 Do the steps above for the second bead. Attach earwires and you are done! What's great is that I accidentally wrapped them in opposite directions so that they mirror each other. This was a total accident, but glad it worked out this way. I wore my new earrings to work and they earned me several compliments. What do you think of my new pair of earrings? I think they're FABULOUS! Those complements you earned are well deserved. 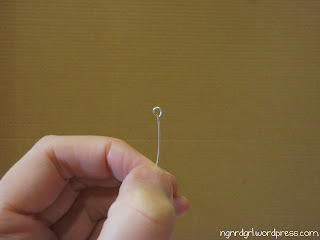 I love the length, the simplicity, the detail of the wire wrapped halfway around the bead. This is a great design, Bethany, and you make it look very do-able with your photo tutorial. Brava! So pretty! 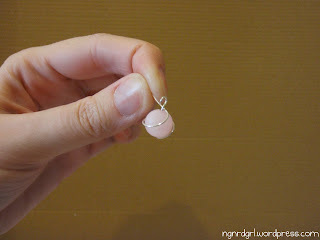 Thanks for sharing another wonderful earring wire tutorial! I'm really loving seeing all of your designs! 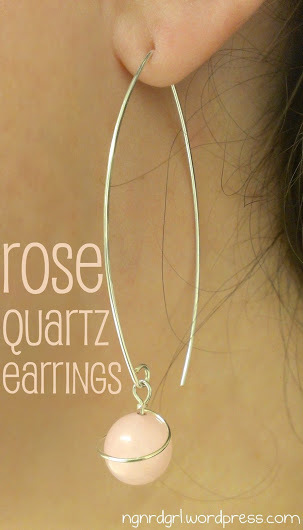 I love the rose quartz - so dainty! 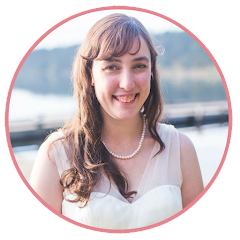 I'm visiting from Pin Me Party, and I'll be pinning. These are so beautiful! I want to get into jewelry making and you're inspiring me. Love these earrings! Thank you! I'm really pleased with how these turned out. You should! It is such a fun and rewarding craft. I was talking to a coworker who is also getting into jewelry making. We agreed that it has much less cost and time commitment then sewing. By the way, I LOVE your blog! I am following you via twitter, facebook and bloglovin' now. You have such fun and clever projects! These are gorgeous!! Thank you for sharing at our Pinteresting Party! Thank you! You have a great party. I enjoy it every week. Those are very pretty, Bethany! This makes the techniquee look easy! I have always loved wire wrapped jewelry. Maybe I will give it a try. I like to make my own earrings and I will be using this technique. I love the Rose Quartz.